The hardness of rough is an important part of our Rock Tumbling Recipes. 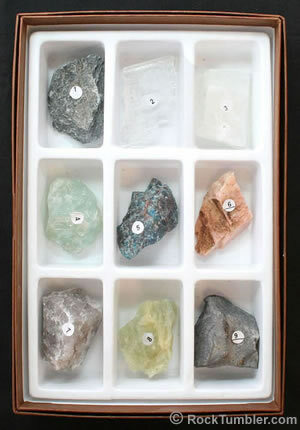 Hardness Testing Kit: (1) talc; (2) gypsum; (3) calcite; (4) fluorite; (5) apatite; (6) orthoclase; (7) quartz; (7.5-8) beryl; and (9) corundum. Diamond is a hardness of 10 but is not in most kits due to cost. Hardness is the resistance of an object to being scratched. If Object A can scratch Object B then Object A is harder than Object B. The greater the hardness difference between Object A and Object B the more severely Object A can scratch Object B using the same amount of force. The most often used rock tumbler grit is made of silicon carbide, one of the hardest man-made materials. As your rocks are tumbling in the barrel, particles of silicon carbide grit get caught between the rocks and scratch their surfaces. This constant scratching rounds the sharp edges of the rocks and smooths their surfaces. The hardness of your rough is an important thing to consider in rock tumbling. The standard rock tumbling instructions of one week in coarse, one week in medium, one week in fine and one week in polish were developed to tumble agate, jasper, petrified wood and quartz - the most commonly tumbled materials. These materials are all quite hard, have similar hardnesses and can easily survive a week in coarse grit. However, if you are tumbling softer materials such as obsidian or sodalite or glass, one week in coarse grit is too long - it will reduce them to tiny particles. If you know this in advance you can tumble soft materials for less time. This will maximize the size of your stones, save electricity, save wear on your equipment and improve the output of your tumbling. Harder rocks, such as beryl and topaz, are worn away more slowly by coarse grit. These rocks must be tumbled in coarse grit longer to develop a smooth surface and a nice rounded shape. In 1812, Friedrich Mohs, a German mineralogist, developed a simple test for determining the relative hardness of rocks and minerals. He selected ten different minerals with a range of hardnesses and assigned hardness numbers to them. The softest mineral was said to have a hardness of 1. The second softest was assigned a hardness number of 2 and so on up to the hardest mineral being given a hardness of 10. Any unknown mineral that could be scratched by the mineral with an assigned number of 5 was softer than 5. Any unknown mineral that could scratch the mineral with an assigned hardness of 5 was harder than 5. If the unknown mineral and the number 5 mineral could scratch one another their hardnesses must then be equal. The hardness scale developed by Friedrich Mohs is still in widespread use today and is known as the Mohs Hardness Scale. Purchase a set of hardness picks to help you find the hardness of your materials. The standard rock tumbling instructions were written for materials that have a Mohs hardness of about seven. Jasper, agate, petrified wood, and quartz are materials for which these rock tumbling instructions were written. One of the important rules of rock tumbling is to "tumble rocks of similar hardness together". Why? If you tumble durable agate (which has a Mohs hardness of 7) with obsidian (which has a Mohs hardness of between 5 and 6) the obsidian will be ground to a very small size by the time the much harder agate is shaped and smoothed. Tumbling rocks of similar hardness together enables you to increase the production weight of your tumbled stones and dispose of a lot less mud. If you have two pounds of agate and two pounds of obsidian and tumble them in two mixed batches, the two batches will need to be tumbled for seven days each to make sure that all of the agate has been properly shaped and smoothed. However, if you separate the two materials you might tumble the agate for seven days, tumble the obsidian for five days, and achieve good results. By doing that you will enjoy the following four benefits: 1) your obsidian tumbled stones will be larger because they were tumbled for only five days; 2) you were able to finish all of your tumbling in just 12 days instead of 14; 3) you reduced the amount of electricity consumed by two days; and, you put two less days of wear and tear on your equipment. In the table on this page we list over 50 commonly tumbled rocks, minerals, mineraloids and man-made materials, along with their Mohs hardness. They have been listed in the table from hardest at the top to softest at the bottom. You can use this information as a guide for determining what types of rocks should be tumbled together, what types of rocks will require more time and what types of rocks require less time. This is a general guide and a starting point for experimenting. The size of your rough, the size of your tumbler and the conditions of the rough might dictate more or less tumbling time. Experiment, keep records, and you will learn a lot. We sell a variety of rocks for tumbling. To be sure that they will perform well for our customers we determine their hardness, assess their size and shape, and test them before offering them for sale. When we offer them for sale we publish the methods that we used so that our customers have a suggested "recipe" for tumbling that material. You can learn more about this on our Rock Tumbling Recipes page.